This page contains pictures and information about Flower Wasps in family Tiphiidae that we found in the Brisbane area, Queensland, Australia. 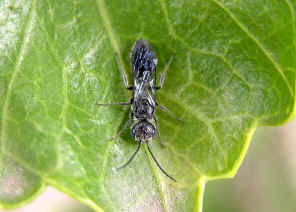 Species in this Tiphiidae family are known as Flower Wasps. They are from small to medium in size. They are all solitary wasps. They can be recognized by the slender body. Males are usually dark brown to black in colours marked with yellow. Males and females may look very different. 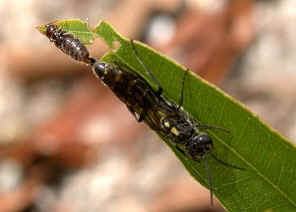 Females of the major Australian subfamily Thynnine are wingless. 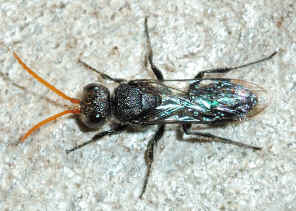 They have small eyes with short curled antennae and usually no ocelli. 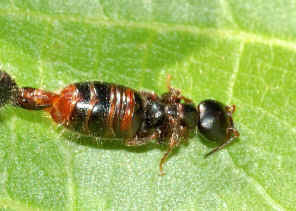 Their larvae parasite on soil-dwelling insects such as burrowing beetles larvae and mole crickets. They pupate inside host body. 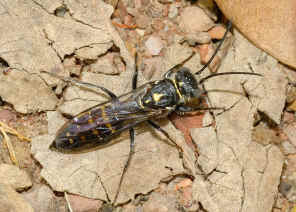 The female Flower Wasps has to burrow through the soil to find the host and lay an egg on it. 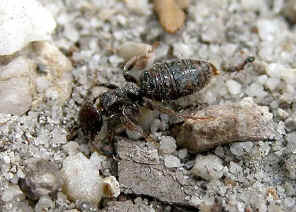 The female legs are modified for digging. For species in subfamily Thynnine, the females' wings are lost. 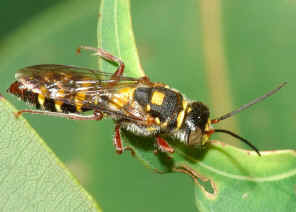 However, the female wasps, as the male wasps, are feed on nectar and have to visit flowers. Wingless is a big disadvantage. 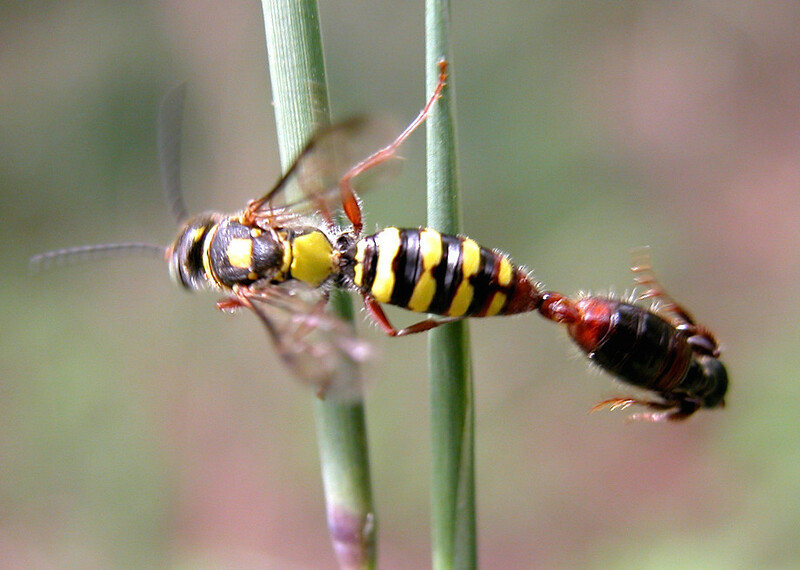 Flower Wasps evolved a mating behaviour which the males help the females on feeding. Their mating time is very long. 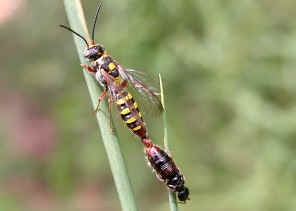 It is common to see a male Flower Wasp carrying a wingless female, with tail to tail attached, flying between flowers. The transportation is part of the mating procedures. Despite they are wingless, female flower wasps will sting if disturbed. 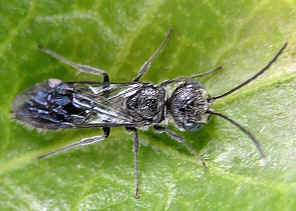 Most species are in subfamily Thynnine which the females are wingless. Females in other sub-families are winged. The wingless females have the shiny and smooth body which distinguished from those wingless females in family Mutillidae. 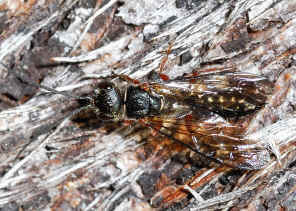 Thynnine is the largest subfamily in Tiphiidae in Australia. Species in this subfamily Thynnine are dark and often marked with brightly coloured. Males are fully winged and usually larger than the females. 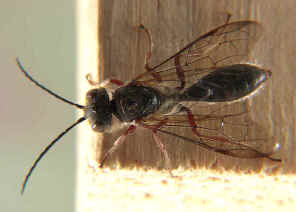 Females are wingless and mostly dark colour without bright markings. 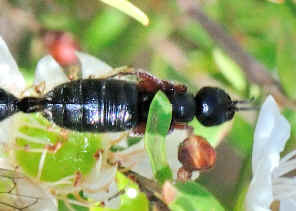 Larvae are parasitoids on the larvae of Scarab Beetles. We took those pictures when the winged male carrying the non-winged female flying between grasses while they were mating. More information and pictures please check this page. 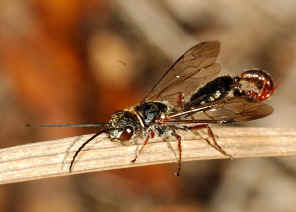 On Jan 2009 in Brisbane Koala Bushlands near Burbank, we saw two male flower wasps looking for something on the sandy forest floor. We believed they sensed the smell of female flower wasp. Please check this page for more details. 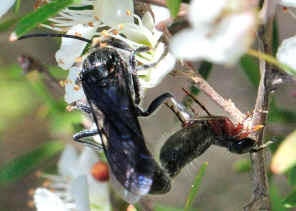 The winged male is black in colour with a broken white line on prothorax. 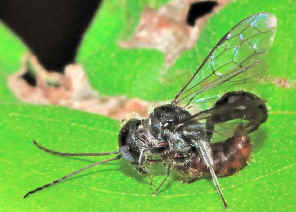 The wingless female is dark brown in colours. Pictures taken on Dec 2009 In Anstead Forest. Please check this page for more information. We saw a wasp landed and rested on a dry grass with its abdomen tip attached with something. Looked a bit closer we found that the attachment was a wingless wasp. Then we understand it must be a flower wasps mating pairs. They flied away after we took a few photos. More pictures and information can be found in this page. 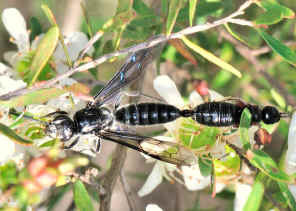 Both the winged male and wingless female of Steel-black Flower Wasp are steel-blue in colours. Please check this page for more information. The above picture was taken in Yimbin Park on July 2009. Please check this page for more information. 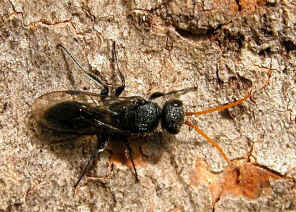 This wasp is commonly seen searching on tree trunk. It is black in colour with yellow antenna. Please check this page for more information. Pictures were taken on Dec 2003. Click here for more infomation. 1. Insects of Australia, CSIRO, Division of Entomology, Melbourne University Press, 2nd Edition 1991, pp 977. 2. Insects of Australia and New Zealand - R. J. Tillyard, Angus & Robertson, Ltd, Sydney, 1926, p293. Last updated: July 18, 2012.